When New York City’s Deputy Mayor Alicia Glen worked for the investment bank Goldman Sachs, she focused on urban investments and affordable housing finance. She also happened to strike a dozen deals and set up a $100 million investment fund with a developer named Ron Moelis, whose for-profit L+M Development Partners is one of the most active partners with city government on affordable housing projects. That doesn’t sit well with liberal tenant activist groups, who say the city is giving short shrift to housing nonprofits that could offer deeper affordability to low-income residents. Through personal email correspondences, Crain’s detailed the close relationship between Glen and Moelis that continued once Glen entered office. Since Glen became Deputy Mayor, L+M has embarked on 13 different affordable housing projects, and Glen regularly helped Moelis gain access to other parts of the city government on issues regarding L+M business. In one instance, Moelis, through Glen, was able to connect with the venture capitalist Alan Patricof for some deal making on an East Harlem project (“Just here to help!” Glen wrote). One thing the investors needed help with was relocating a New York Police Department parking facility so Moelis could build on the site, something the then-police chief, Bill Bratton, was open to, but said would require additional funding. Glen told Moelis and Patricof that she would put a word in with with Deputy Mayor Anthony Shorris on the matter. According to an L+M spokeswoman, the effort was unsuccessful. 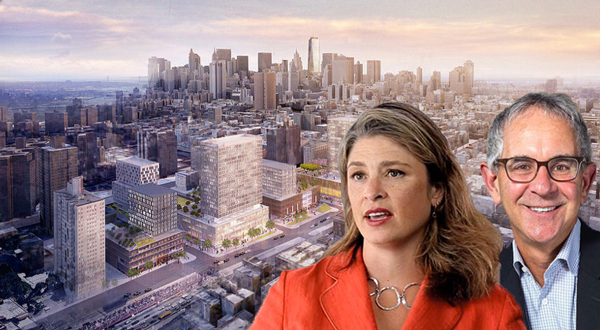 When L+M discovered a deed restriction at its Greenpoint Landing development site, where it looked to bring 5,500 apartments, the company’s COO Lisa Gomez, wife of REBNY boss John Banks, asked Glen to ask the state to waive it away. The state did so, though Glen’s office maintains it had nothing to do with her. The email correspondences reveal a number of other instances in which Glen would connect Moelis to top aides to Mayor de Blasio or other city official to discuss everything from garbage pick up to redevelopment proposals. However, some of the matters on which Glen assisted Moelis did not end up falling in L+M Development’s favor, Crain’s notes. But it’s a level of access that smaller, nonprofit builders complained they have never had. According to a review of her City Hall schedule during her first two years in office, Glen regularly made time for real estate and finance interests but rarely met with nonprofit housing representatives. “We don’t have access at the mayor, deputy-mayor level,” Andrew Reicher, executive director of the Urban Homesteading Assistance Board, a non-profit co-op developer, told Crain’s.